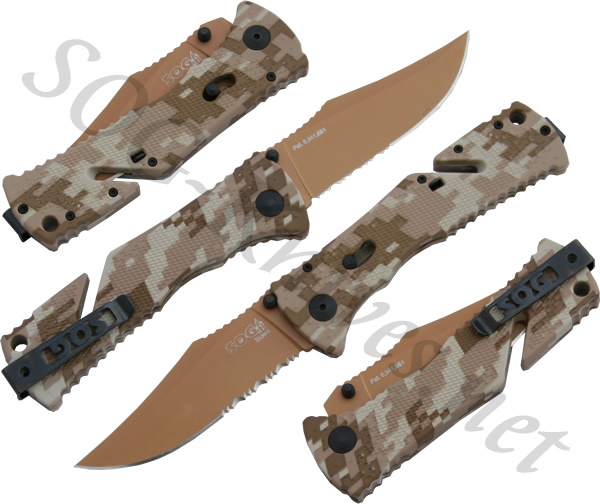 The SOG Trident model TF-5 has a Zytel handle with a digital desert camo pattern. The AUS 8 blade is coated in copper TiNi, tactically blending it with the common colors of the gulf region. The blade is assisted by a torsion spring inside the handle and is released by the famous SOG Arc-Lock technology. If you haven't tried the Arc-Lock technology you should because, with a little practice, the knife can be closed with one hand. A groove has been cut out of the handle which allows the owner to cut small things without opening the knife. The reversible bayonet style pocket clip allows for a discreet carry. Own a SOG Trident Desert Camo Knife TF5-CP? Tell us how you like it! Got a question? Ask! Somebody will answer!